The kitten is stuck in the chimney above the fireplace. Photo courtesy Rural Metro Fire Department. Firefighters try to find where the crying sounds are coming from. Photo courtesy Rural Metro Fire Department. Sunday morning, June 10, Rural Metro firefighters from the Carefree station 821 responded to an unusual rescue. 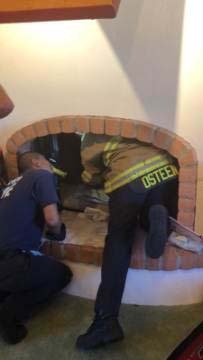 A homeowner heard the sounds of a kitten crying and realized it was coming from above the fireplace flue. 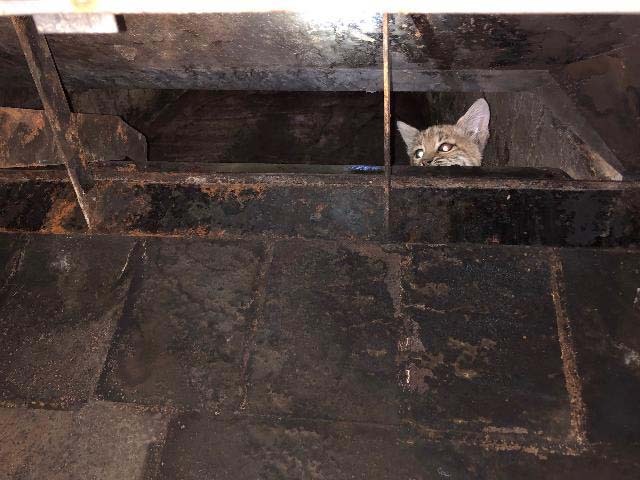 A bobcat and her kittens had taken up residency on a rooftop observation and one of the kittens had fallen down the chimney. 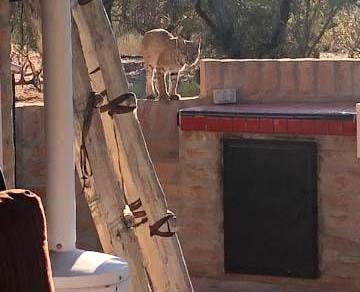 The mother bobcat kept a close eye on the rescue proceedings through the window. Once the kitten was safely rescued firefighters snapped a quick photo and reunited the kitten with its mother. Both cats immediately headed to the roof. The next morning the same cries were emanating from the fireplace area. Apparently both kittens had fallen down the day before. The resident’s wife was able to wrap her arm and hand and retrieve the second kitten, which was quickly taken outside to be reunited with its family. Mama bobcat watches the activity through the window to be reunited with its mother. Photo courtesy Rural Metro Fire Department.